That title is bound to catch your interest. I know, it did mine. So~welcome Gail Pallotta. Can you please shed some light on the subject. The story behind Hair Calamities and Hot Cash begins many years ago in a small town at the foothills of the North Carolina Mountains, where my mother ran a beauty shop. As a youngster I spent hours listening to the customers discuss how to make the latest recipe, what to do about world affairs and everything in between, including family relations, births, deaths and weddings. Clients planned showers, graduation parties and get-togethers for new neighbors while my mother shampooed and rolled hair. Because of the clientele, my mother’s shop fascinated me. Aww, what a precious story, Gail. Tell us more about the book that evolved from your special memory. Now you’ve got me interested. Where can we purchase the book? 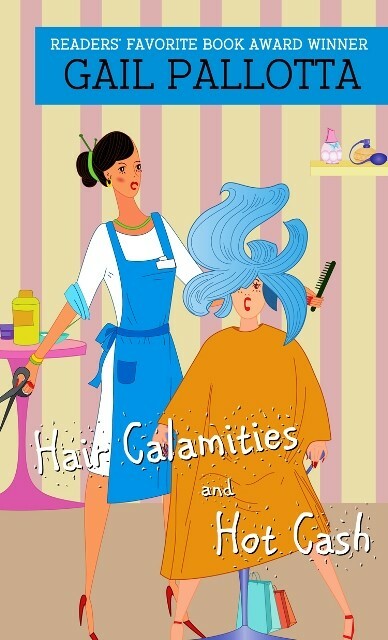 Attention: Gail is giving away an e-copy of Hair Calamities and Hot Cash. To enter, make a comment and tell us what you are most grateful for this thanksgiving. You could just be the winner!! I definitely want to read this one. Thanks for sharing. Melissa, I had the opportunity to be Gail’s critique partner when she wrote this. It’s a great story. Thanks for stopping by to read about Hair Calamities and Hot Cash. As for what I’m thankful for this Thanksgiving.Well that’s a lot. God has blessed me greatly. I’m thankful for God getting me through my days of being bullied, I’m thankful for God blessing me with two degrees, I’m thankful for my freedom, the people who serve and died to give me my freedom, I’m thankful for friends and family, I’m thankful for my blogging friends but most of all I’m thankful for Christ dying on the cross for my sins. Because of Him I’m redeemed. I’m thankful for so much more too. Crystal, your Thanksgiving thoughts are a blessing to me. I also am grateful for our veterans as my husband is a 20-year Army vet. Thank you for commenting. Amen. Thanks for stopping by and for sharing the things you are grateful for, and reminding all of us of our many blessings. Always thankful for family and friends and the knowledge that He loves me. Thanksgiving is a great time to remember all our/my blessings and thank all those who serve. Me, too, Lauren. Thanks for stopping by. Thank you for coming by and ditto for a big “thank you” for all who serve. I’m grateful that all four kids will be getting together for the first time in ten years. Then our daughter and hubby and four kids are moving farther away for his new job! That’s a big thanks, too! Hi Paula, Thanks for coming by. Enjoy your family gathering! WE HAVE A WINNER!! PAULA SCHRECKHISE CONGRATULATIONS!